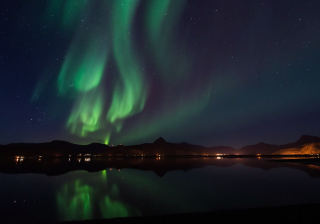 Auroras dance in the skies over Norway in a video from Level 4 production company. Image uploaded Jan. 15, 2014. Multicolored cosmic lights dance over mountains, bridges and lakes in an amazing new video that highlights the beauty of the northern lights as seen from Norway. The spectacular video of Norway's northern lights — entitled "Sixth Element" and produced by the production company Level 4 — runs nearly five minutes in duration and showcases the aurora borealis in the sky near Nordeisa, Troms, Norway, with an ethereal musical score setting the mood. The footage was captured from August to mid-November 2013. Particularly striking images from the video include meteors streaming overhead as green northern lights flow through the sky. The Milky Way provides a backdrop for a green and red glow above snow-topped mountains. "We shot this video with the intent to showcase what we can do for future clients," Richardsen said. "For this video we used quite a bit of double coverage so we could intercut between scenes with the same aurora at the same time, most of the scenes was shot using ultra wide angle lenses, while we sparingly used 24mm shots and fisheye shots." Auroras are created when showers of charge particles blown out from the sun are caught in Earth's magnetic field. Some of these particles are directed toward the poles, where the strike neutral particles in the planet's atmosphere, creating the colorful lights. The northern lights are called aurora borealis, while their southern counterparts are the aurora australis. Other planets in the solar system also have auroras. Scientists have observed auroras at the poles of both Jupiter and Saturn. Editor's note: If you have an amazing night sky photo or video you'd like to share for a possible story or image gallery, please contact SPACE.com Managing Editor Tariq Malik at spacephotos@space.com.